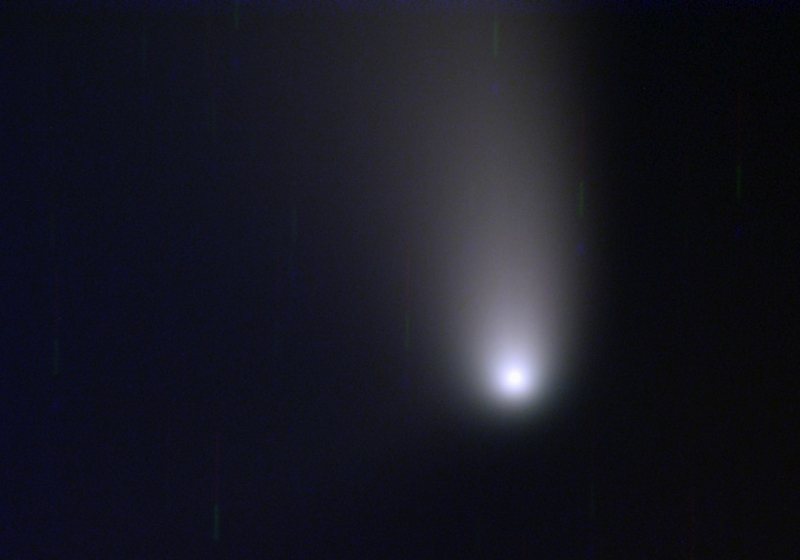 The University of Hertfordshire: Clear skies for Pan-STARRS comet at last! Finally, after weeks of bad weather, astronomers at the University’s Bayfordbury Observatory have managed to image Comet C/2011 L4 (better known as the Pan-STARRS comet) as it makes it way out of the solar system, maybe to return in 106,000 years' time! This image, taken by David Campbell, is a colour composite of images taken through red, blue and green filters using one of the Observatory's 40cm telescopes. The coloured trails are caused by the telescope tracking the comet which is moving against the more distant background stars. The comet was spotted about two years ago by the Panoramic Survey Telescope and Rapid Response System (Pan-STARRS) based in Hawaii. This system surveys our skies on a continual basis – its primary mission to detect “Near-Earth Objects” such as asteroids and comets. The Pan-STARRS comet is still visible with the naked eye in the west just after sunset in the constellation of Andromeda moving into the constellation of Cassiopeia in early May.